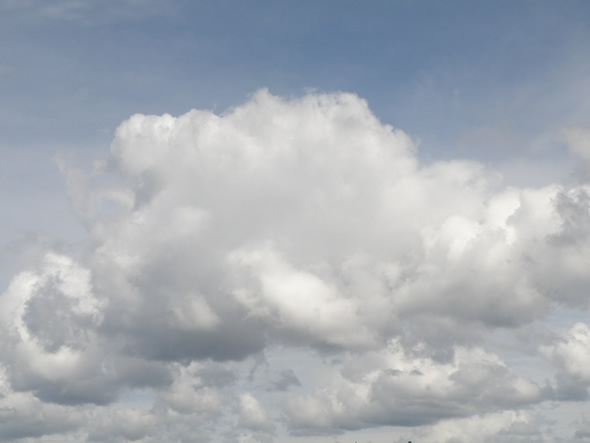 The fluffy clouds of summer roll by as we prepare to move into a new season. Welcome to September's issue of Whispers, the newsletter of the Dereila Nature Inn - your cyber nature centre. After a bit of a break for summer, it's great to be back again in your inbox. We hope that you've had a most inspiring summer filled with wonderful encounters in nature. 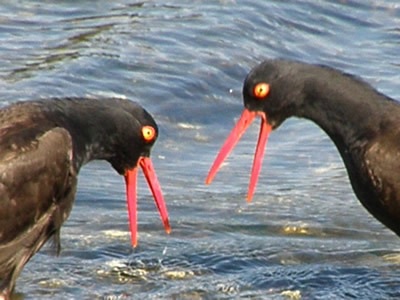 Once again our newsletter has a little of something for everyone as we celebrate the world of nature. Thanks so much for subscribing and supporting our project! 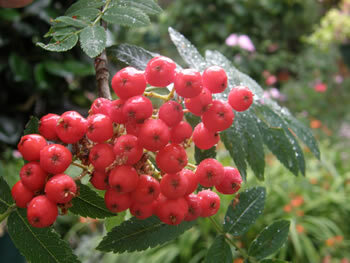 Which common decorative plant is considered one of the most poisonous in the world? What do you think this rather bizarre close-up image is? These dazzling beauties have been organised into a handy guide according to family group. 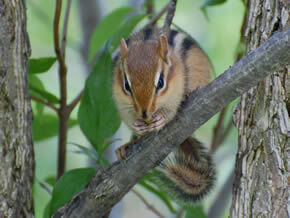 This At-A-Glance Guide features images of critters large and small that are part of the Inn's collection of photographs. Jackie Olenik, from Welland, ON submitted the two photos above. 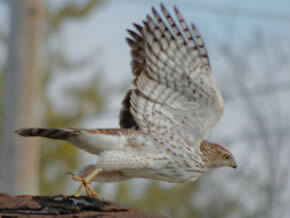 The one on the left is called "Chipmunk" and the second is "Hawk in the City." 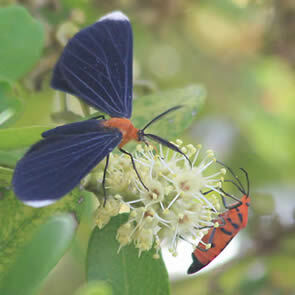 Janiskay, of Hollywood, FL sent in these two super photos of moths. 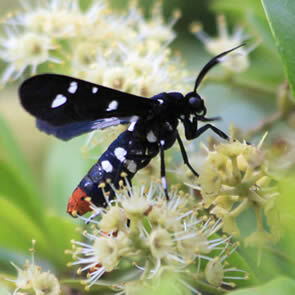 On the left, with a super name, is a Polka-dot Wasp Moth, Syntomeida epilais, and the other is a White-tipped Black Moth, Melanchroia chephise. Thank-you so much for sending in your pictures! We really appreciate you taking the time to do so and being part of our newsletter. Each month we select a bug, wildflower and bird of the month. Here are this month's choices: Bug - Green Bottle Fly; Wildflower - Great Burnet; Bird - Acorn Woodpecker. This month for our wandering image we're up in the mountains. 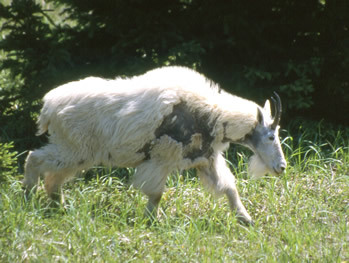 This Mountain Goat, Oreamnos americanus, was spotted in early summer while it was still shedding its thick winter coat. Mountain Goats have an amazing ability to traverse the steepest and most dangerous of slopes. Read more about them on our Walking in the Wild page. Autumn comes very early in the mountains. 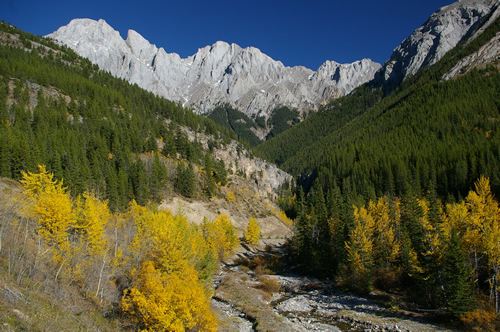 Here in Alberta's Kananaskis Country west of Calgary, the aspens along King Creek are a lovely yellow. Standing in the background is Mount Blane (2993m/9820 ft). You can see more pictures and take the Inn's virtual visit to Kananaskis by clicking here. Once again we have selected an image that is waiting for a funny caption. We've come up with a couple of possibilities but know you can probably do better! Number one: "Just a minute. Can I possibly get a word in?" Number two: "Yes, dear. Yes, dear, Very good, dear." 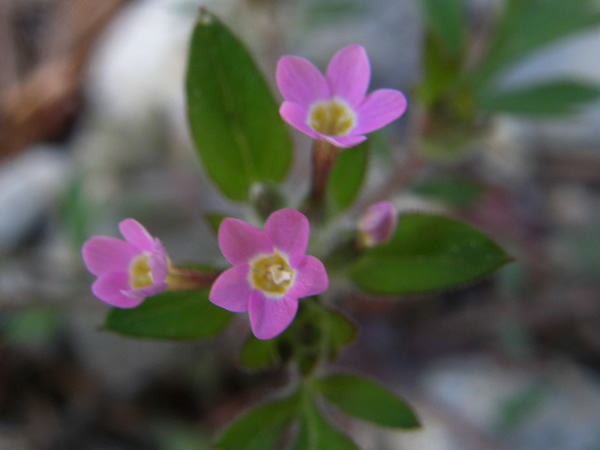 Vari-leaved Collomia, Collomia heterophylla, is an annual plant found on parts of the west coast of North America. It's a member of the Phlox family. The Collomia part of its scientific name (which, as you probably noticed, is the same as its common name) comes from the Greek word "kolla" which means "gluton" refering to the fact that the plants seeds are sticky when wet. The second part of the name, heterophylla, basically means "different or varied leaved." This helps explain the connection between its names and helps identify it from other species of collomias. 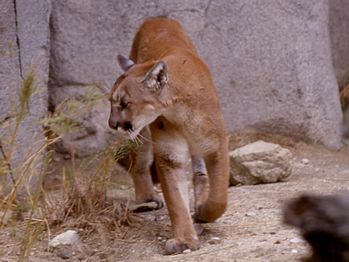 A man walking through the mountains came across a very small guy standing over a dead mountain lion, the biggest he'd ever seen. "Did you kill that mountain lion?" asked the man. "Yeah, I killed it with my club," the other replied. "Wow, you must have a big club," he said. "Yep, there's about forty of us." "Well, you'd better run! He's not dead!" 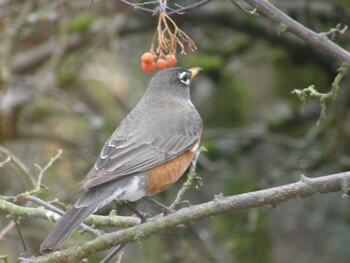 At this time of the year, as the berries ripen on the trees and shrubs, it is the time to pick a few bunches to save for the birds when the weather turns cold. Put them in the freezer for a few months. When the weather changes, the berries are all gone and food is scarce, you can tie a wire around a bunch of the ones you've stored and then hang them from a branch in the garden. The birds will thank you! For the past eight months we have been adding a new nature-themed photograph every week to the Inn which means we have posted lots of images featuring wildlife, scenery and flowers. Click on the collage below to see the entire selection. 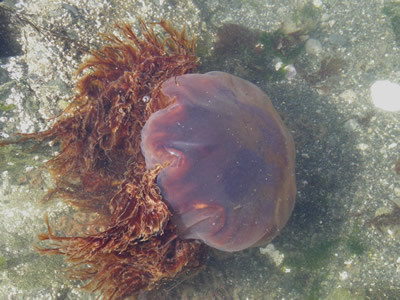 Did you know why the jellyfish Cyanea capillata was given the common name Lion's Mane Jellyfish. 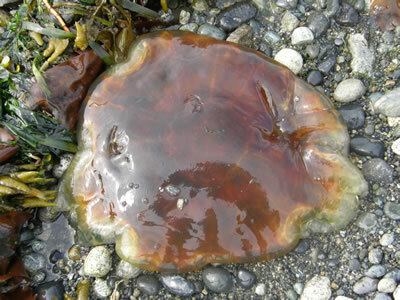 It doesn't look too fierce when washed up on the beach! However, when it's free and swimming in the water, its appearance changes and the reason for the name becomes more evident. 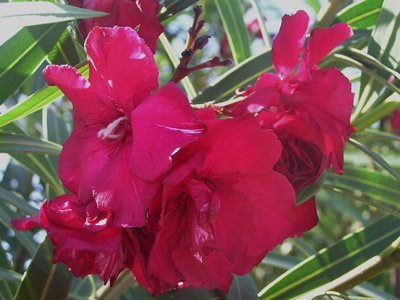 All parts of the Oleander plant are toxic. 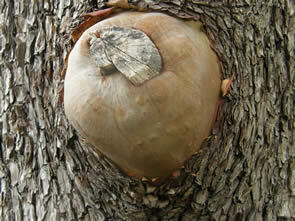 The seeds are the most toxic followed by the leaves and flowers. Even the stems are toxic! 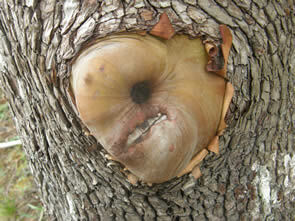 It's a rather odd burl on a tree. That was a tough one this month, so we don't expect too many correct answers! Watch for the next issue in your mailbox during the first week of October.